The number one reason that residential customers choose window film is to protect their valuable furniture, draperies, art and collectibles – even their flooring – from fading. With this in mind, you should know a few things. The myth. The vast majority of people associate the effects of fading entirely with ultraviolet light. It is therefore very easy to understand why they might assume that a window film product with a 99% ultraviolet rejection rating could eliminate fading from their home. However, since other factors contribute to fading, one needs to understand the “rest of the story.” The facts. It is very important to understand that ultraviolet light contributes only 40% to the total fading problem. Visible light contributes 25%, and solar energy (heat) contributes another 25%, resulting in a full 50% contribution to the problem. The remaining 10% of what causes fading is directly tied to the quality, (or lack of quality), of the dyes used in furnishings, fabric, and carpet. Understanding this makes it easier to see why stopping only ultraviolet light will not eliminate fading. No solar control window film product is guaranteed to stop or cure a fading problem. However, professional quality window film can significantly reduce fading caused by ultraviolet, visible light, and solar energy. The degree of protection you obtain is closely tied to the type of film that you select. Don’t forget! You are also protecting yourself! There are two types of UV radiation; UVA and UVB, which damage skin and increase your risk for skin cancer. SolarGard® films provide sunscreen-like protection while you’re in your home. Many of our films are recommended by the Skin Cancer Foundation! 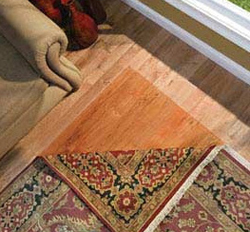 If you are interested in learning more about protecting your furnishings from fading, contact Solar-X of Sarasota today.